New Jersey government officials on July 5 took a tour of Veolia’s Trenton Thermal Energy District Network, the proposed technology hub for a proposed Downtown Trenton Microgrid. During the tour, New Jersey Public Utilities Board (NJPUB) president Richard S. Mroz announced the board had approved funding to carry out feasibility studies for 13 proposed microgrids in town centers throughout The Garden State. The New Jersey town center microgrid feasibility studies mark the latest in NJPUB’s efforts to follow through on the priorities set out in the State Energy Master Plan (EMP). More specifically, the community microgrids are being considered as a responsible, cost-effective means of enhancing power and energy grid resilience and spurring deployment and use of DER microgrid technologies. 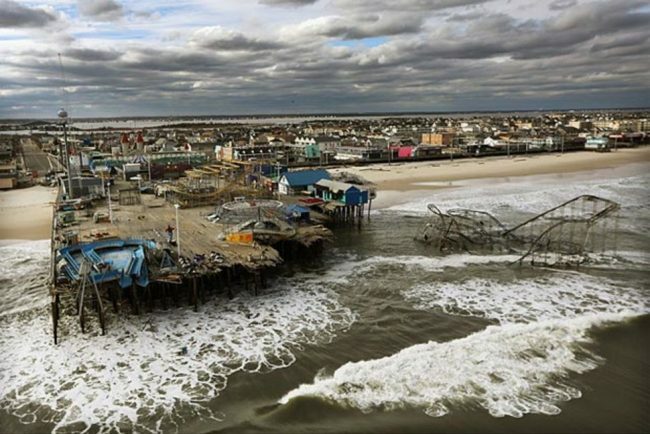 Along with neighboring states along the Eastern Seaboard, New Jersey made improving utility grid resilience and natural disaster emergency preparedness a higher priority in 2012 in the wake of Superstorm Sandy. DERs and microgrids were singled out as potentially cost-effective means of realizing these aims in a 2015 update to the state’s EMP. Expanding and upgrading the Trenton Thermal Energy District owned and run by Veolia North America is seen as a cost-effective means of establishing the core of the state capital’s town center microgrid, as well as a DER and microgrid tech development hub. At present, the Veolia Trenton Thermal Energy District Network relies on combined heat and power (“CHP”) systems to provide 13,000 tons of chilled water capacity and 132,352 pounds per hour of steam/hot water to approximately 35 customers in Trenton’s central business district. Feasibility study project partners intend to assess the prospect of adding solar energy generation capacity, as well as additional CHP and other electricity infrastructure that would enable the proposed town center microgrid to operate during both normal and emergency conditions. “A distributed generation facility in downtown Trenton would improve resiliency by reducing the potential for grid failures related to major weather events or other causes from impacting critical government services,” Bill Golubinski, manager of Energy Initiatives for the New Jersey Division of Property Management and Construction, was quoted in a press release. The N.J. Department of the Treasury, Division of Property Management and Construction, along with Mercer County, the Mercer County Improvement Authority and the City of Trenton, recently filed an application to carry out a feasibility study for the proposed Downtown Trenton Microgrid. “I’m excited to get the feasibility studies started for this Downtown Trenton Microgrid and the other twelve proposed microgrids as the final reports will provide great detail on options concerning designs, connections, financing options and the types of buildings to be included in a town center microgrid,” Mroz said. Construction of the Downtown Trenton Microgrid would secure electrical power and energy for critical public facilities when the power grid fails while improving overall energy efficiency at the same time, according to project partners. Plans call for connecting the N.J. Justice Complex, the N.J. State House, N.J. Treasury Taxation Building, N.J. Department of Labor Building, N.J. Department of Health Building, N.J. Department of Community Affairs – Ashby Building, N.J. Department of Human Services – Capital Plaza One Building, N.J. Department of Environmental Protection Building, N.J. Treasury – Mary Roebling Building, NJ Motor Vehicle Commission Building, NJ Network Building, Old Barracks, Thomas Edison College and the NJ War Memorial to the town center microgrid. That would enhance the security of financial, legal and industrial data and records in the Taxation, Justice and Labor Buildings. In addition, it would enable government services to continue operating during grid outages and other emergencies, providing power, heat and cooling for buildings that could serve as assembly areas or emergency shelters, such as the War Memorial, Old Barracks Museum and Thomas Edison College. The State House would also be served by the microgrid so that key emergency services continue to function.